how NOT to make it » Blog Archive » and the Holiday Cards are… done. and the Holiday Cards are… done. 2016 marks the 12th and final round for my self-produced Holiday Card campaign. When I started I think I had about 40 people on my holiday list, and now it’s closer to 400. I’m not getting any younger and my new kid is likely going to be the focus of future holiday greetings anyway. But I did put together all the cards and the stories behind them into a neat little book at Blurb if you want the full hard-copy, print experience here. There’s also a free PDF version of the book here if that’s more your speed. AND…that’s not all. 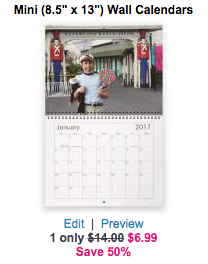 I also have this nifty Wall Calendar for 2017, but if you want one, let me know and I’ll order you a copy. This entry was posted on Saturday, December 17th, 2016 at 21:21	and is filed under Friends and Freaks, Pranks, Work. You can follow any responses to this entry through the RSS 2.0 feed. You can leave a response, or trackback from your own site.